One of the world's great orchestras is celebrating an important birthday - and we think they're absolutely wonderful. 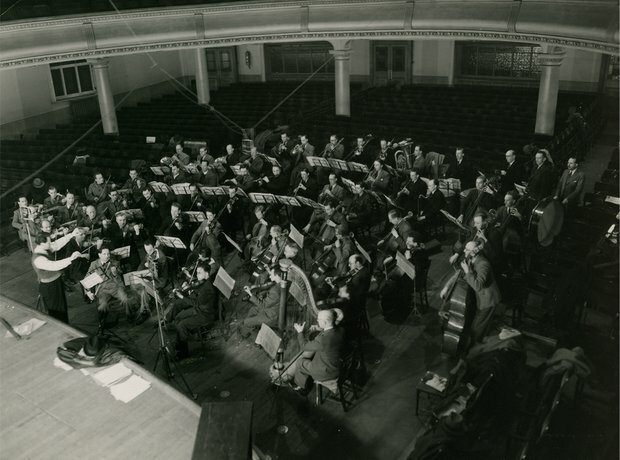 Here's a picture from the orchestra's 10th anniversary celebrations in 1955. Make ours a big slice, thanks. Every year the Philharmonia performs at more than 160 concerts, numerous outreach events, and records music for films, computer games and commercial CDs. Phew. Concert programmes have always been innovative, recordings have always been championed – and now the Philharmonia has added video game music to its repertoire, as well as a digital ‘virtual Philharmonia Orchestra’ and iOrchestra. Since 1995 the orchestra have been based in London's cultural hub at Southbank Centre, filling the Royal Festival Hall with splendid sounds.